When I was decorating the kitchen last year I had fully intended doing the pantry too, but when push came to shove, I didn’t. I’d had such a fight to get the wallpaper off in the kitchen (that I had pasted up 15 years before), I couldn’t face the same again in the pantry. Nor could I face finding homes for all the stuff that was in there. Back in March I bit the bullet and started stripping wallpaper. Only a tiny space, but a pain to do. The contiboard shelves had to be 25+ years old and definitely needed to be replaced. Pine I thought, would be fine. I could paint them with some of that Cuprinol wood wash, in an ash colour. That would sort of fit in with the limed oak effect in the kitchen proper. As I was driving to B & Q one Wednesday evening to take advantage of their 10% discount day for oaps to purchase said wood, I started to think that it would look quite nice if I could resource a double base unit like those in the kitchen. So my trip to Norwich to save 10% on just some sandpaper and varnish was a bit of a waste of time! 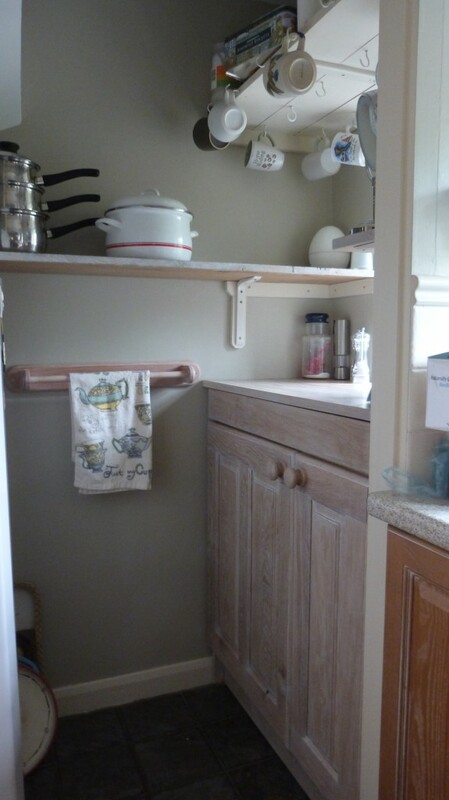 I scoured ebay and found similar kitchens, in Manchester, the south west and Essex. Mmm, Essex isn’t far, I thought. But it was a whole kitchen and was sure they wouldn’t want to let me have just one double base unit. Back to the drawing board. Then I remembered John, the carpenter, who lived in the village. I know he’d made whole kitchens for various other village folk. Perhaps I could get a quote from him to replace the shelves and build a front, to make a cupboard? To cut a long story short, he came over and said that yes, of course he could do that for me. So we agreed a price. He was to make a cupboard across the alcove, in oak (that he had) with two shelves, and I was to lime wax it. It took a bit of time to arrive, and when it did it was a piece of furniture ! He had made a proper cupboard with sides, top and shelves. Only thing missing was the back. It looked brilliant and, thankfully, slotted in fine, despite the wonky cottage walls! 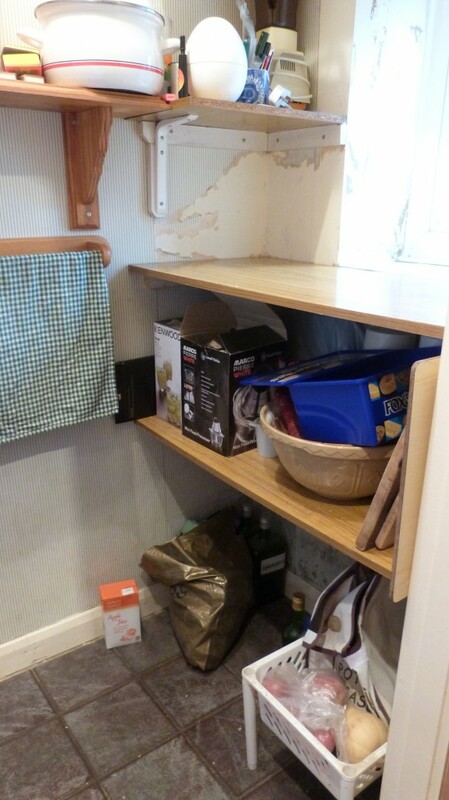 He also replaced the shelves above the cupboard and along the back pantry wall, and over the fridge. I spent a happy morning roughing up the grain with wire wool and applying lime wax. I think it looks great. I wonder what you think? This entry was posted in House, Kitchen by Country lover. Bookmark the permalink. Looks ace! That’s a proper workable space now, love the washed effect. Wahoo! Now I can let go from my work days, last thing has been done….. Thanks for your kind words re my pantry. It’s much tidier, isn’t it?! That looks really great! You’re lucky to have such a good carpenter living near by. Thanks Cathy for your visit. Yes,he’s a good ol’ boy. I say ol’ boy, but he’s only two years older than me! ‘spose that makes me old too!